Happy birthday Carol Kendall (The Gammage Cup) and Mildred D. Taylor (Roll of Thunder, Hear My Cry). It’s the birth date of Roald Dahl (1916-1990), James and the Giant Peach, Charlie and the Chocolate Factory, Matilda and The BFG. In 1788 New York City becomes first United States capital. It’s National Celiac Awareness Day. Read Everybody Bakes Bread by Norah Dooley, illustrated by Peter J. Thornton, but not everyone can eat bread made with wheat. Also read Eveyone Cooks Rice by the same author and illustrator. Born in Denmark on September 13, 1920, Else Holmelund Minarik came to the United States when she was four. At first she hated English, the new language that she had to learn, but she became devoted to it—and to teaching first graders how to read words that had once perplexed her. As she observed her students, Minarik realized that at the point when they had mastered basic reading skills, they wanted a book a bit more sophisticated than a picture book. But most novels fell outside their range. She worked on a prototype for such a book and brought it to Susan Carr Hirschman, then Ursula Nordstrom’s assistant at Harper. 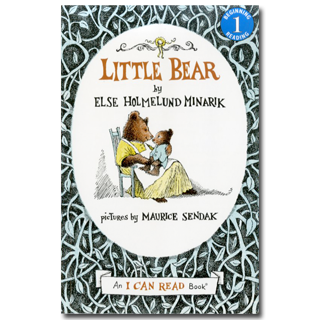 Minarik believed that her manuscript, some stories about a character called Little Bear and his mother, was perfect for students at the end of first grade or beginning of second. Hirschman took the manuscript “What Will Little Bear Wear” immediately to Nordstrom. For some time Nordstrom had been trying to interest some of the Harper authors on the same kind of idea—and they all had turned it down. Now here was real teacher, with experience, who could help frame the books. Although Minarik’s role was not acknowledged at the time, she, in fact, became the consultant for the entire Harper I Can Read series, as these books were called. She helped establish character counts for each line (no more than forty), the spacing between the lines of text, and made sure the subjects of the books remained appropriate for first and second grade students. For the truly lovable character that Minarik created, Nordstrom had no trouble choosing her favorite illustrator, Maurice Sendak. Sendak’s Little Bear has heft and weight as he interacts with his mother in a warm, respectful, and playful way. In one story Little Bear pretends to fly to the moon, and his mother plays along. However, when he tires of the game he says, “You are my Mother Bear/and I am your Little Bear/and we are on Earth, and you know it.” The four stories in the first Little Bear book, which would be followed by others, attest to the universal need for love, acceptance, and independence. With more than six million copies in print, the Little Bear books have beguiled children since 1957, convincing them that they really enjoy this new skill called reading. We can all be grateful that Else Minarik took what she learned in a classroom and made it possible for millions of children to enjoy books. Originally posted September 13, 2011. Updated for . My 7th child is reading Harper I Can Read books. We love Little Bear, but Little Bear is a close second to Frog and Toad at our house! Thanks for highlighting Little Bear! I just finished reading ‘Dear Genius’, the letters of Ursula Nordstrom, and enjoyed reading about how the I Can Read series started and developed. Actually, all the letters were so interesting – a great read. Little Bear is a wonderful early reader series, even the TV series was better than most – it managed to maintain the sweetness and creativity of the books. I loved reading Little Bear when I was a kid! (and I loved the television series too). That’s so interesting about how the I Can Read books came to be. So many of favorite stories were I Can Read books! Anita: Candace and I love Else Minarik’s Little Bear books, too. The stories are sweet and the early Sendak art is quite charming. I had no idea “No Fighting, No Biting!” was one of Minarik’s books. I’ve been searching for it for years with no success. I was beginning to think it was a figment of my imagination. Thanks for the confirmation! Bob: Yes, that is one of my favorite picture books! Serve me a bowl of Birthday Soup! I love Little bear and this first introduction to him. This book was a favorite of mine (I even made a space hat!). What a heartwarming experience it was to see both my children develop the same love for the book and Little Bear himself. It is often one of the first books I pull out for those beginning/emerging readers in my school library. Bob, you should check some school libraries for “No Fighting, No Biting,” I have seen many in my travels. It was great to read how the Little Bear books came into existence. I think what is so great about them (and other successful early readers) is how child centered they are. The fact that Minarik’s creation came from a focus on children’s needs and interests only adds to the appreciation I already had for these books. The Little Bear series has characters children can relate to, entertaining stories, and countless opportunities for children to learn and feel successful. I’m so glad this book was highlighted. Maurice Sendak was a great artist! I LOVE this book. It was one of my favorites growing up. Thanks for sharing it, it makes me want to pull it out and read it again. I *still* love Little Bear, and I still have my childhood copy. 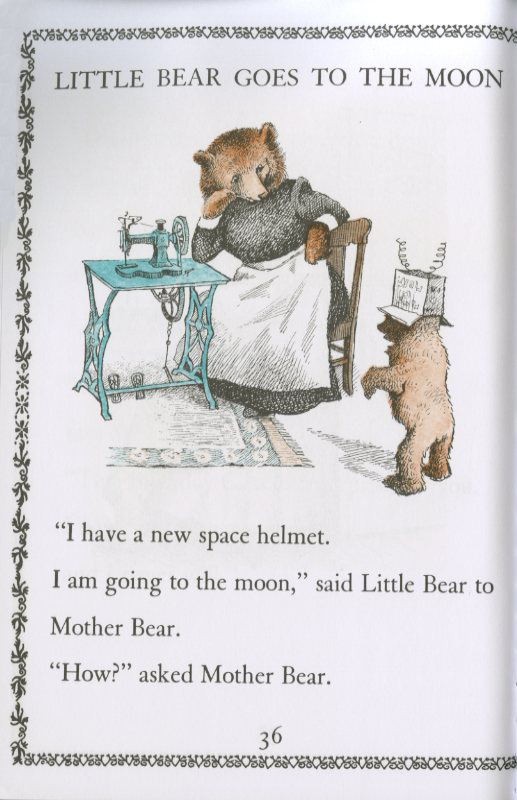 Little Bear going to the moon is one of my favorite of favorite stories! Little Bear has endured not just for his charming naivte, but also because of the rhythm of Minarek’s poetry. her ear for the language and her understanding of the world from a child’s point of view suit children. And on top of all that, she gives the earliest readers such a satisfying experience: chapter book success! Thanks for this piece. And the chance to pause and think about that old friend. I loved reading Little Bear when I was a child. I have a number of them in my classroom library. They’re a favorite with several of my students. What an incredible imprint they started! !